I've installed vinyl over millions of rivets, and I've tried every technique and tool imaginable. Here are the two ways I have found to be the best possible methods. By Rob Ivers, Owner, Rob Ivers, Inc. If you ever apply graphics over rivets, or you want to get PDAA Master Certified, this article is for you. I am amazed (and disappointed) with how few people know how to do rivets well. Many can wrap a car like crazy, but their rivet skills are near zero. All they are lacking is someone to show or tell them (or write a how-to article). Proper graphics application over rivets is easy to learn, increases application speed, and leads to good-looking and long-lasting results. There are really only two ways to do rivets properly. Read on, and be willing to learn and master both methods. 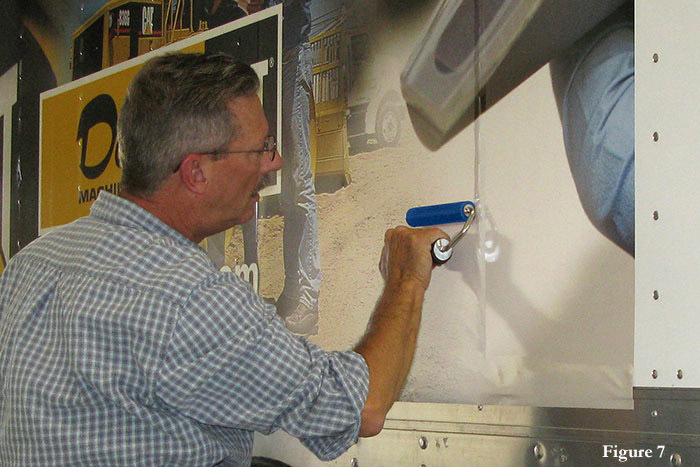 Applying vinyl graphics to box trucks and trailers is fairly common in the marketplace. With that comes the need to deal with the rivets. Not all trailers have rivets; some have screws, and some are completely smooth. 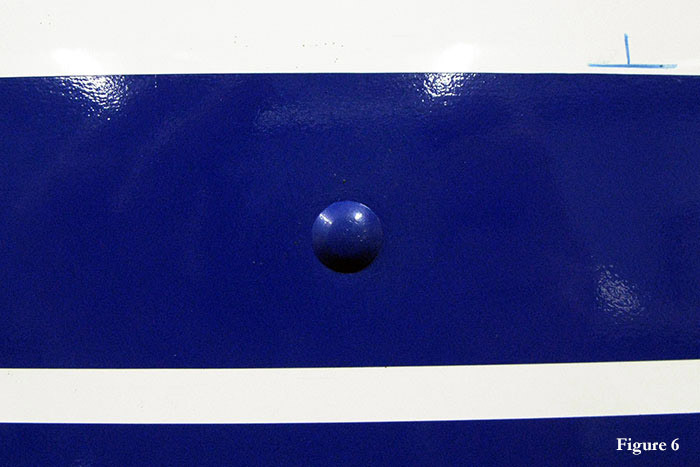 This article is meant to be quite helpful in the most common situations - how to apply vinyl to normal trailer rivets. It is not a comprehensive study of all types of trailer surfaces, rivets and screws. "Normal" trailer rivets vary slightly from one trailer manufacturer to the next, but most are relatively small, and have a smooth top. 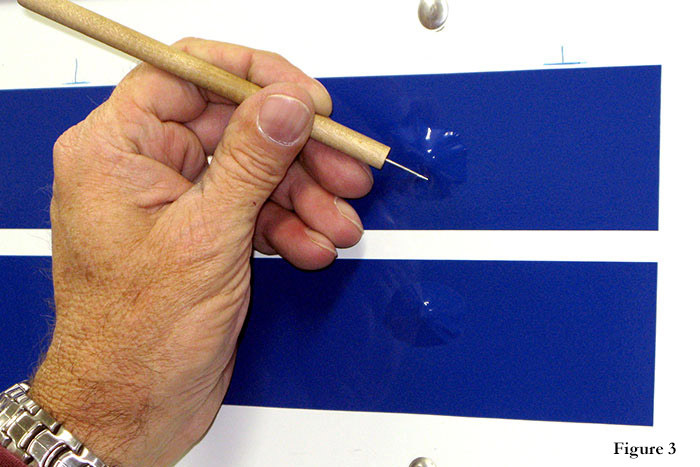 Using the methods that follow, virtually perfect results can be achieved: The vinyl conforms to the shape of the rivet ("painted-on" look), and there are no air pockets nor bubbles; all of the adhesive is in contact with the surface, and should stay that way. I've installed vinyl over millions of rivets, and I've tried every technique and tool imaginable. The two ways explained here - the traditional (or standard) and the foam roller - are those I have found to be the best possible methods. Why two ways? 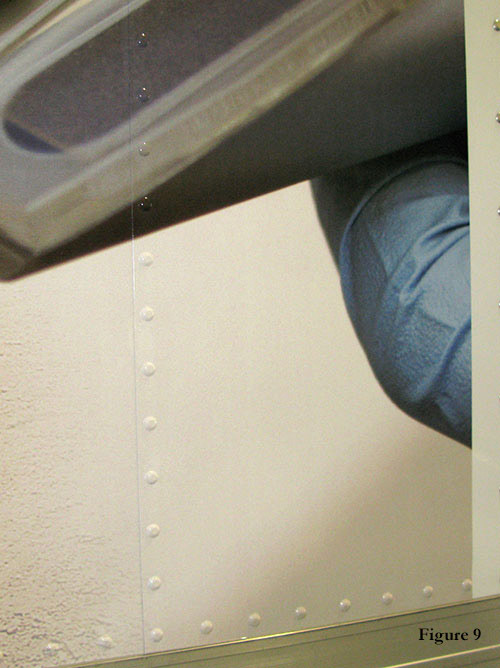 Because the newer way, while good and very fast, is limited in use, whereas the standard technique will work for any type of cast vinyl-graphic intended for use over rivets. Please note that while calendered vinyl may suit your purposes, it will never be able to conform tightly ("painted-on" look) to rivets like cast vinyl can. The surface must be cleaned properly and completely dry. Use the right solutions for the contaminants present - Xylol or something similar for inorganic (tar and grease) contaminants; detergent and water for organic (dirt and mud) contaminants; and Isopropyl 70 percent rubbing alcohol for final rinse. Wet and scrub to loosen debris with one towel, and dry before evaporation with a second. Moisture will collect behind the rivets when the vehicle is dripping wet, whether from rain or washing. If present, fluids behind the rivets must be removed. Heat the rivets' heads and surrounding areas with a propane torch until all fluid has evaporated. Additionally, the vinyl must be applied dry without the use of application fluids or wetting agents. For the sake of brevity, I'm leaving out much of the vinyl installation process to be more specific about the rivet sealing process. A few application tips: Squeegee parallel to the smallest dimension of the graphic; keep the graphic taut, the squeegee low and flat, and use firm pressure. When you squeegee over rivets, line up the center of the squeegee with the rivets (Figure 1). This allows the squeegee to make contact with the vinyl around the rivet on both sides, applying it, smoothing it, and pushing out the air. The desired result is a small round pocket of air around each rivet. After the entire graphic has been squeegeed, if there is premask, remove it carefully at a 180-degree angle (Figure 2). 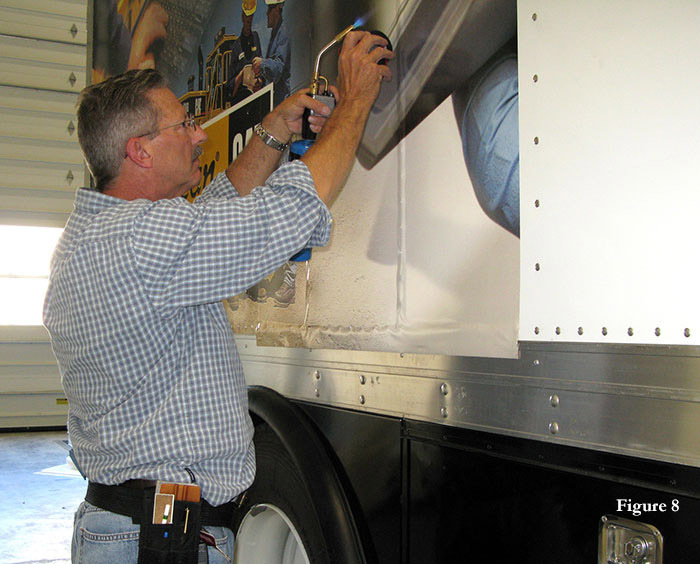 Cut the vinyl over any trailer seams, and squeegee the loose vinyl, tucking it into the seam. Using an air release tool (a small, needle-tipped device), give the air a place to escape. Poke one small hole underneath each rivet (Figure 3), right where the rivet meets the trailer surface. Brush in a circular motion using a rivet brush, beginning just outside the round pocket of loose vinyl surrounding each rivet, spiraling in toward the rivet. It only takes one or two revolutions to push out most of the air. This is cold brushing, because no heat is used. 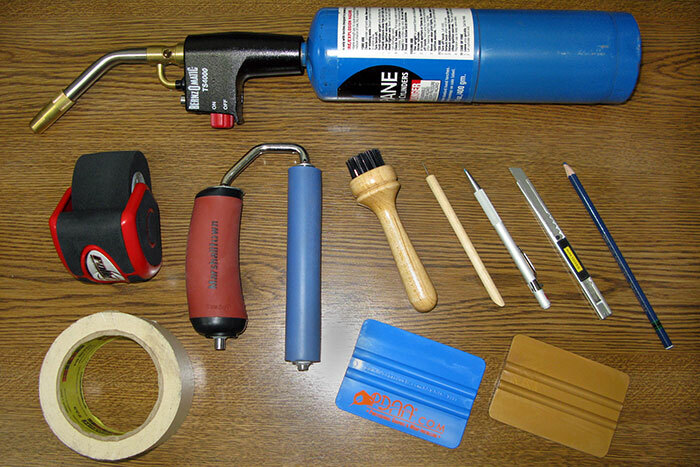 Next, using a propane torch or a heat gun (Most professionals find the torch to be superior. 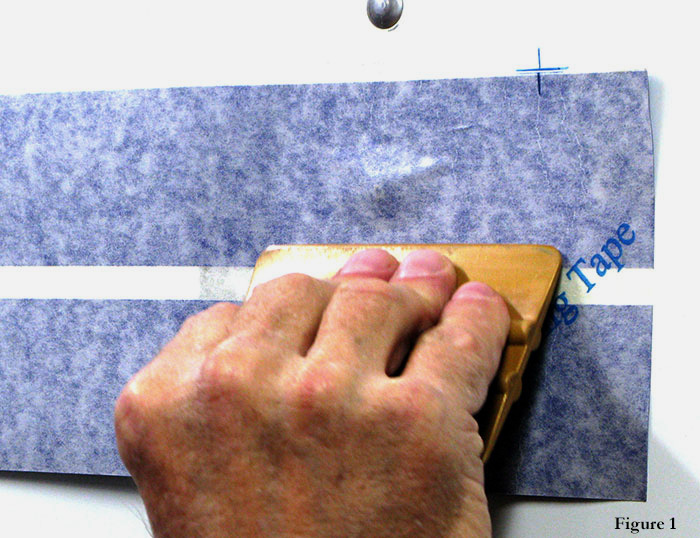 ), warm the loose vinyl slightly and brush again (Figure 4). Notice I said warm and slightly; too much heat on loose vinyl will damage it. If you get it too hot, just let it cool before brushing. Repeat the heating and brushing (usually three or four times) until all of the air is gone. With each repetition, use more heat and a tighter circular brush pattern (Figure 5). Once all of the air is out, heat again and center the brush on top of the rivet; push it in very firmly, and just jiggle in very small, tight circles for that "painted-on" look (Figure 6). After a row of rivets is completed, post-heat each rivet in the row one more time (no brushing) to ensure they stay tight. If they're truly tight (and all of the air is out), you can give them a lot of heat without damaging the vinyl. 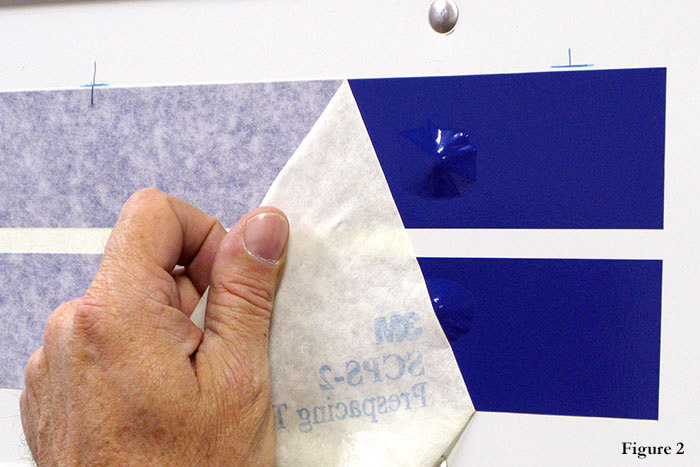 Three conditions must exist for the roller method to be viable: Air egress, cast vinyl with a cast vinyl laminate, and no premask (application tape). The method utilizes foam roller tools - a wider one for the area between rivet rows and a smaller one for the rivets themselves. 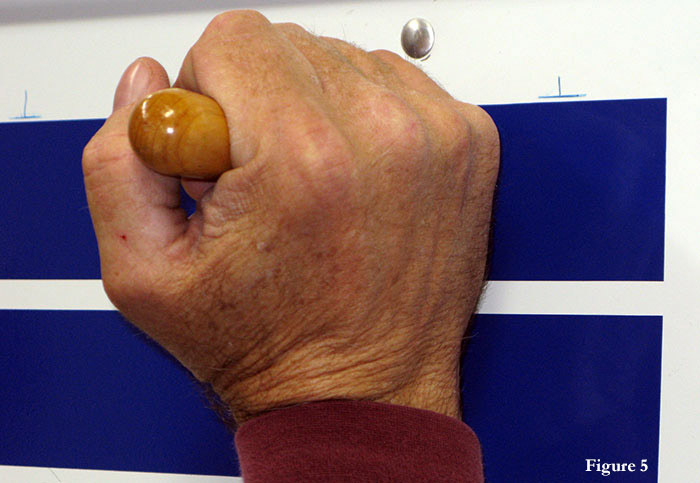 For the wide roller, I use 3M's Power Grip Rapid Roller CPA-2 or Geek Wrap's Big Easy tool. Both are about six-inches wide, and make quick work of applying the vinyl between rivet rows. I use GForce Products, LLC's RollePro for the rivets themselves. Position the graphic; remove all of the liner, and tack where needed to maintain alignment. Roll the vinyl vertically between two rivet rows (Figure 7), and then use the RollePro and a torch to seal both rows (Figure 8). The beauty of this technique is that the air has the entire vertical area to escape - not just a channel. Switch back to the wider roller, and roll over close to the next rivet row, but not on the rivets. Then use the RollePro again. Repeat until the graphic panel is finished. Cut and tuck any seams as before (Figure 9). When using the RollePro, you must leave an open area for the air to escape. Go heavy on the heat, and light on the RollePro. That's all there is to it. 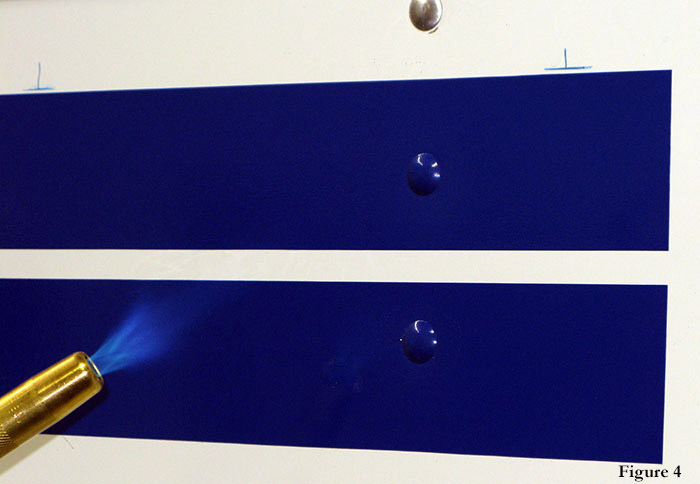 Loose vinyl cools off quickly, so only heat and roll two or three rivets at a time. Heat the vinyl to about 180 degrees Fahrenheit. Try some practice vinyl first. Learn to heat it as hot as you can without burning it or causing the roller to leave a visible unsightly path. If done properly, the rivets will be very tight with little to no air left behind. If they are too loose, it means you did not get them hot enough - or you did too many at once and/or let them cool off too much before rolling. Once mastered, this method can be very fast with extremely high quality. Whatever method you choose, practice makes perfect. This article appeared in the SGIA Journal, September / October 2014 Issue and is reprinted with permission. Copyright 2014 Specialty Graphic Imaging Association (www.sgia.org). All Rights Reserved.